Haiku. A crystalline drop of vision, delicately colored, conveying a pinpoint moment in time. Starting with its structure of five-seven-five syllables, its possibilities are endless. Meld that in with wet-on-wet watercolor, the very essence of patience and release of expectations, and you have a combination which inspires and soothes. Artist Lisa Shea provides seasonally-themed pairings of words and images which tantalize and delight. In each case she pondered the poem while sitting down with a six-inch by six-inch piece of watercolor paper. She then made one and only one pass at creating an image to go with that poem. There were no do-overs. There were no fixer-uppers. Just as in life, she took a deep breath, and began. The result was often swayed by water movement, air movement, and other factors far beyond her control. And that's all right. The journey is what matters. Join Lisa on her journey, and share your thoughts on the results! 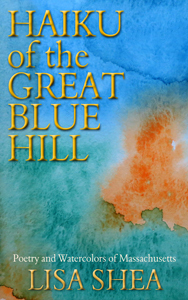 Haiku of the Great Blue Hill - Poetry and Watercolors of Massachusetts is Lisa's first book of published poetry. Lisa has been writing poetry since she was a young girl. She has always adored the Japanese culture and ran a feudal Japan newsletter for ten years. While Lisa was born in Maryland, she has lived in Massachusetts, with two brief departures, for nearly the past thirty years. She adores its rolling hills, mossy forests, and serene coastlines. All author�s proceeds from Haiku of the Great Blue Hill benefit local battered women's shelters. Lisa has written 40 fiction books, 78 non-fiction books, and 36 short stories. �Massachusetts� was the name of a Native American tribe which lived south of Boston. This name loosely translates to �Great Blue Hill� � referencing the blue granite rock of the Milton / Canton area.